It's been quite a while since I shared some of my favorite recipes. So here are a few for you to try out. Sauté onion and garlic in margarine and oil. Add chicken and cook till done. Add water chestnuts, bamboo shoots and cashews. Make sauce over all adjusting as you go. Cook 5 minutes to blend flavors. Make stock of all liquid and spices. Bring to boil. Drop in finely cut pieces of chicken. Cook 2-3 minutes. Drop in noodles and almonds. Simmer till noodles are done. Drain. Toss with ¼ cup olive oil to coat. Serve. Stir well into 1 gallon container. Keeps months in fridge. Stir before each use. At his time of year we are often so busy preparing for holidays that keeping up with the day-to-day things like meal planning can take a back seat. I gathered some of my favorite EASY main dishes that take just minutes to prepare. Rachael Ray will have nothing on you! Place steak and onion in crock pot. Stir in flour to coat. Add remaining ingredients, minus the sour cream. Stir well. Cover and cook on low 8-9 hours. Add sour cream, stir in thoroughly and cook 30 minutes more. Serve over egg noodles. In nonstick skillet sprayed with Pam, slowly sauté garlic over low heat. Add chicken and cook over medium heat about 10 minutes or until brown on both sides. Add broth and lemon juice. Heat to boiling and reduce heat. Cover and simmer 10-15 minutes or until chicken is done. Remove chicken to serving dish. Reduce remaining liquid for around 3 minutes. Pour over chicken. Remove skin from chicken parts. Rinse in warm water and arrange in crockpot sprayed with no-stick coating. In separate container, combine all remaining ingredients. Stir to blend well and pour over chicken, being sure to coat each piece well. Cover with lid and cook on high for 6-7 hours. In a large skillet, melt butter and brown chops on both sides. Remove meat from skillet and add rice, stirring to coat well with the butter. Put rice in crockpot sprayed with non-stick coating. Add all remaining ingredients, stir well and place chops on top. Cover and cook on low 9-10 hours (or on high for 6 hours). Wash fish, pat dry. Cut into 4 equal portions. Brush fillets lightly with yogurt or mayonnaise. Combine remaining ingredients. Dip fish in Parmesan mixture, turning to coat on both sides. Place on shallow baking pan sprayed with vegetable cooking spray. Bake at 450 degrees for 8 to 12 minutes, depending on thickness, until fish flakes easily with a fork. Mix all ingredients in marinating container. Cover and toss together. Refrigerate overnight, turning occasionally. In a large skillet, heat oil over medium high heat and brown roast on all sides. In the bottom of a sprayed crockpot, place the sliced onions first, then the browned roast. Mix remaining ingredients in a bowl and pour over roast. Cover and cook on low 8 hours or until meat is tender and can be shredded with a fork. Pour cooking juices into a saucepan and simmer on the stove until reduced, about 10 minutes. Serve sauce over the top of the beef. Not all works of art are created of paper. As evidence of this I present to you this tasteful trio from Saturday's kitchen. 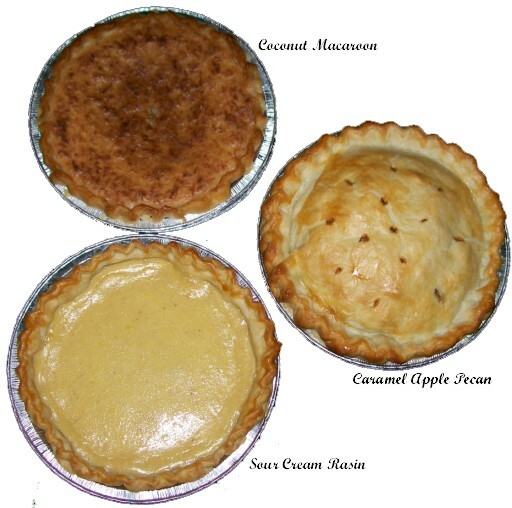 These three handsome pies will make their public appearance on Sunday evening at the pie auction sponsored by Women's Ministries. Not that he does not appreciate my cooking, but none of these flavors are favored by my hubby, who asks that I bid on and return home with a pumpkin pie - or perhaps an apple crumb. In a large bowl, combine green tomatoes, apple, sugar, oil, eggs and vanilla. Into separate bowl, sift dry ingredients. Stir dry ingredients into wet ingredients. Add nuts and raisins (if using) and stir to combine. Divide mixture between two greased 9x5 inch loaf pans. Bake at 325 degrees for 1 hour, or until a tester comes out dry. NOTE: The green tomatoes can be ground and measured out for freezer storage until you are ready to make bread, if you wish.